Sgt. Al Krug and his younger, college-educated partner Casey Kellog are investigating a string of strangulation killings when another victim is found at the Presidio…but a surprising, violent incident at the crime scene makes them wonder if everything is what it seems. The two mismatched cops, with sharply conflicting approaches to detective work, are under intense pressure to get results. It’s a race-against-the-clock investigation that propels them into the deadly intersection of politics, real estate, media and vice… the fertile, fog-shrouded killing field of a ruthless murderer. "Robin Burcell has expertly updated the Krug & Kellog series for old and new readers alike. She knows her stuff and puts it to good use in this entertaining and authentic police procedural." 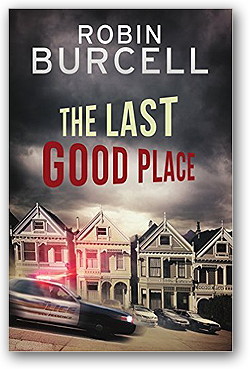 "A whip-smart, fast-paced tale with more twists and turns than a San Francisco street, The Last Good Place is a terrific read. Robin Burcell is a true pro!" "Burcell brilliantly revisits Weston's cop duo and delivers a modern, dark, twisting tale of murder and deception with a puzzle that will keep you guessing until the end." "The Last Good Place is a fabulous reboot of a beloved classic. With smart, clever writing and an elegant plot, Robin Burcell has nailed it. All hail the reincarnation of Krug and Kellog."